Since I started playing Bolt Action, I’ve been wondering about the best way to carry my troops. 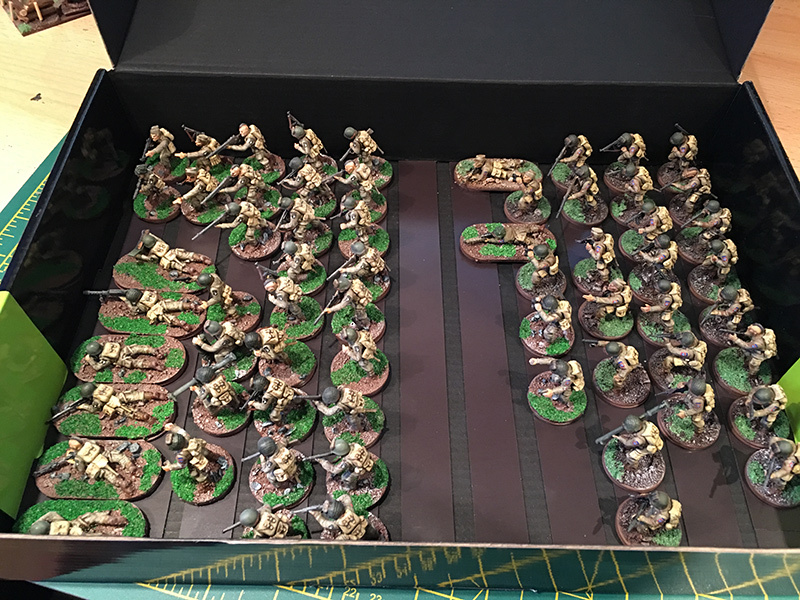 Taking them to and from the wargames club or elsewhere is a little problematic as I don’t have a suitable method to protect them, or even store them at home without the risk of getting damaged. At the moment I’m blu-tacing them individually to the bottom of the box which means it takes a while to remove them from the box, remove the blu-tac and set them out, then I have to add a bit of blu-tac to each figure at the end of the night and fix them in the box. I’ve thought about those custom foam containers where each figure is enclosed in a foam compartment but they seem quite expensive, unless you make a DIY version. So this week I decided to try converting them into magnetic bases and having magnetic sheet in the box. 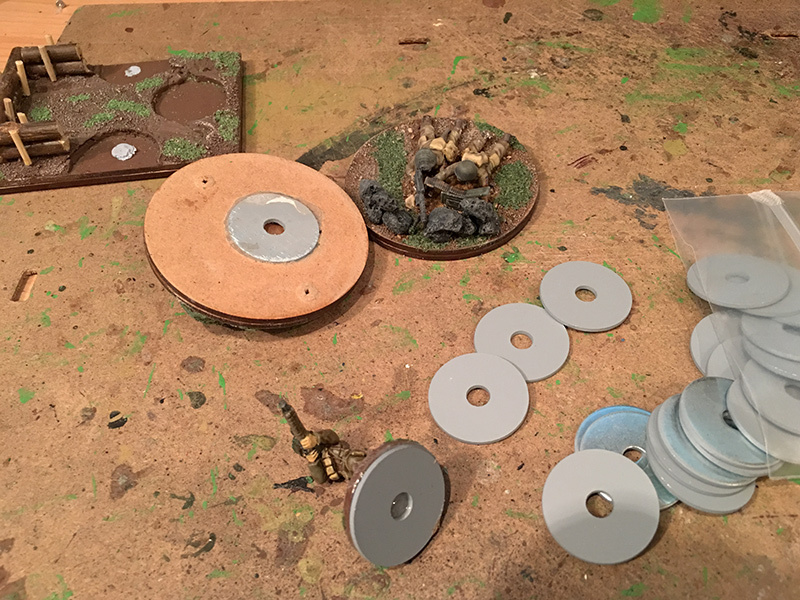 As I have already based most of the figures I thought the best way would be to get hold of some washers, stick those on the bases of the figures and then fix some magnetic sheet to the boxes. I got 10 A4 self-adhesive magnetic sheets from Ebay for £15.95. I then popped into my local Wilkinsons who sell pick and mix nuts and bolts. You can fill a small bag for £1.99 and a large one for £2.99. I got a small bag and filled it with around 160 25mm washers. The washers are excellent value for money. I went in a few days later and got a large bag of washers for an extra quid and reckon I got around 300 washers. I could probably have fitted in quite a few others but I didn’t want to be greedy. 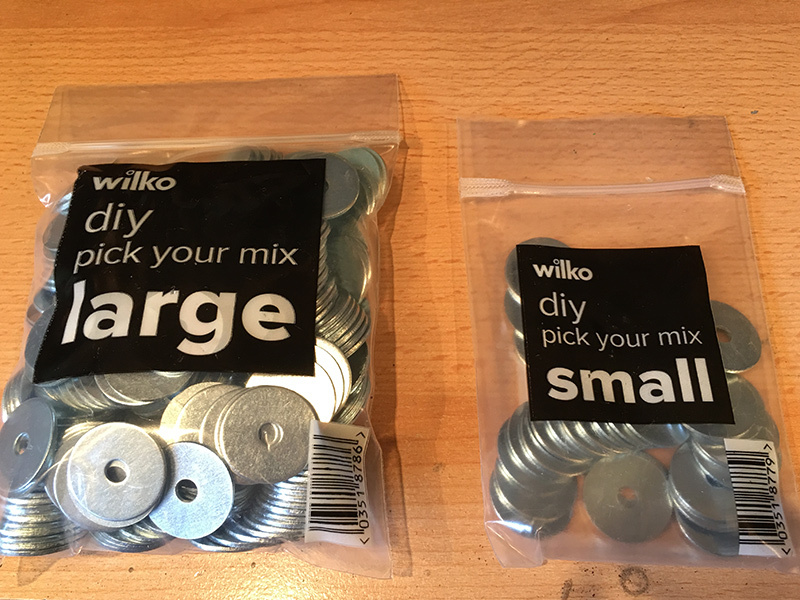 When you think they do small packs of 8 washers for £1.25, getting 300 for £2.99 is a no-brainer. Anyway, once I had all the stuff I spray-painted one side of the washers with grey primer and once they were dried I used epoxy resin to attach them to the MDF bases of my figures. All I then had to do was to paint the edges of the washers brown to match the MDF bases and the figures were completed. 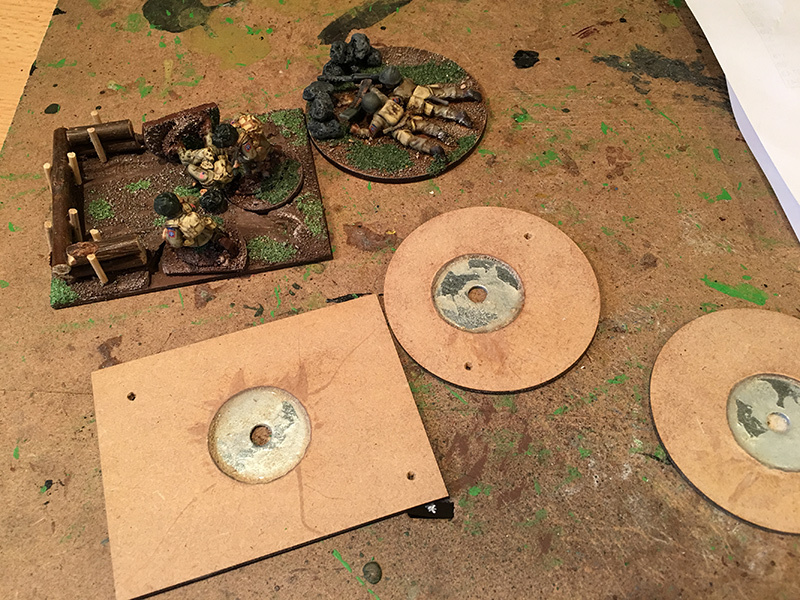 With the prone figures on oval bases I attached two washers. 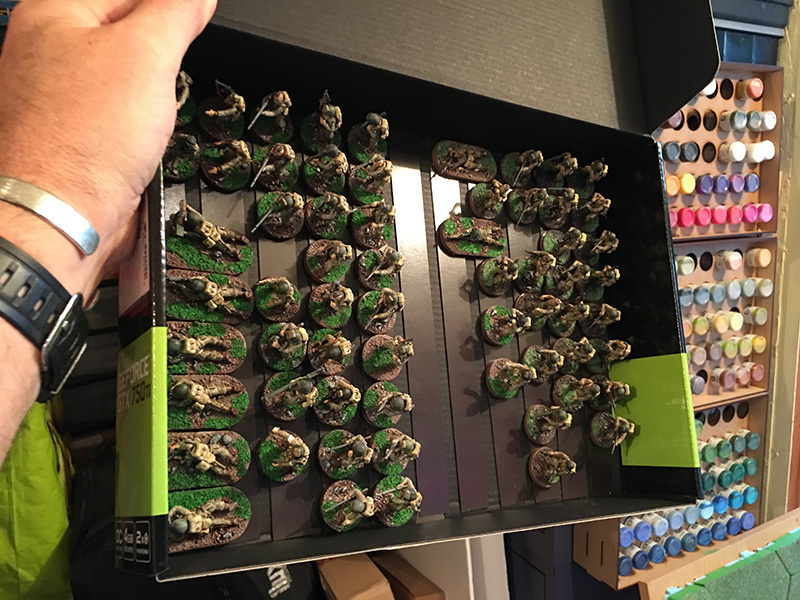 With the 60,mm round bases and the large artillery bases I initially drilled a small hole in the middles and fixed a 6mm magnet but these didn’t stick well to the magnetic sheet so I drilled larger holes in separate MDF bases, glues a washer in and then attached the whole thing to the bottom of the larger bases. I decided to cut of the magnetic sheets int0 20mm strips so I could get more ground coverage with them in the boxes. They stick to the base of the box and the job’s a good ‘un. 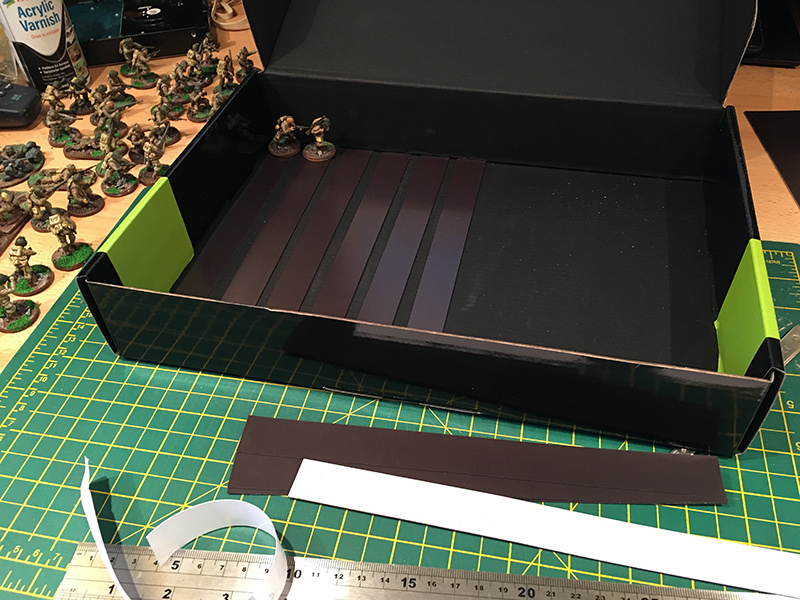 I can now keep my figures safe during transport and have enough sheets for another 9 boxes – I’m using computer component/motherboard boxes as they are usually made of stiff, thick card.